EA Sports Madden NFL 18. This new installment has a lot of improvements, including its debut with the Frostbite graphics engine, the first game history mode, Longshot, and a new way of making equipment and confront them with your friends in MUT Squads. EA Sports Madden NFL 18 is available for PlayStation 4 in physical format for sale in GAME, and for PlayStation 4 and Xbox One in digital format. In this edition will be Tom Brady, the five-time Super Bowl champion and considered "GOAT" (Best player in history), the star that will occupy the front page of EA Sport Madden NFL 18. The video game has taken note of the comments of the Fans and the community with the intention of improving all its features in this edition. At Longshot you will experience an exciting and immersive experience through a fully cinematic gameplay, where you can decide the fate of Devin Wade, a forgotten NFL player on his way to the Draft both on and off the field. This new mode is characterized by a branched dialogue, 7 to 7 institute games and new game mechanics. The story will feature major Hollywood actors such as Oscar-winning Mahershala Ali or Friday Night Lights star Scott Porter. IGN has called the Longshot mode "Fantastic," adding that "it has left them glued to the television." 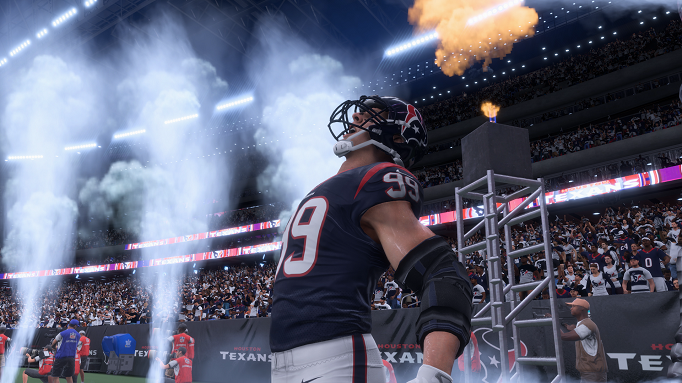 "In Madden NFL 18, whether you're a veteran, new or casual player, you're going to find something that will appeal to you this year," said Sean Graddy, executive producer of Madden NFL 18. "Every year we try to bring Madden NFL a Step later than the previous year. In this edition with Tom Brady on the cover of the game, the history of Longshot, the Frostbite engine, MUT Squads and the new game mechanics, among many other innovations, we are offering an experience of NFL game without precedent. With the transition to Frostbite, EA's exclusive engine, Madden NFL 18 promises to deliver the most realistic images to date. From the breathtaking views of the city, stadium exteriors, player details, lighting and the exiting excitement of the players, fans will feel like they are in a real NFL broadcast every time they play the video game. If you're looking for a competitive experience, you'll enjoy MUT (Madden Ultimate Team) teams that will encourage online team play in Madden NFL 18. With this mode, you'll be able to combine templates to create the best current NFL stars and legends, choose His role and team up with two players to conquer the grid. In addition, the new game mechanic offers a richer field experience thanks to greater accessibility and greater control, so you will enjoy in any game position. Among its features, Madden NFL 18 includes Play Now Live, where you can play the best real NFL games that are playing at that time during the season and continue in franchise mode with the updated templates. Madden NFL 18 also has three new game modes: Arcade, Simulation and Competitive. Now you can decide your gaming experience and customize it any way you like. If you want to play American football anywhere and anytime you can do it with EA Sports Madden NFL Mobile, which has recently released its fourth installment. Madden NFL Mobile includes the biggest upgrade to date, with competitive tournaments, improved graphics and other new features. The Madden NFL Mobile download is free and available on the App Store and Google Play. By the way, gamers can buy madden 18 coins online to make a finely personalized Madden team.